I really enjoy the chance to meet with customers and prospects one-on-one. This week provides me with the opportunity to do just that. 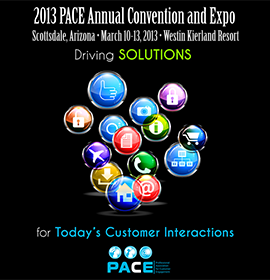 As you are reading this, staff members from PossibleNOW and CompliancePoint are at the annual Professional Association of Customer Engagement (PACE) Convention at the Westin Kierland in Arizona. In between the social activities like golf and tennis and informative sessions on customer engagement, we are speaking with association members about our new products and services that can enhance multi-channel marketing efforts. One of the key concerns among association members is how to effectively comply with the new FCC rule regarding automated sales calls to mobile devices. As you may know, the FCC now requires that marketers obtain written consent from a consumer before delivering any type of advertisement or solicitation call that uses an automatic telephone dialing system to any mobile device. This new law goes into effect later this year, but the time to take action is now! PossibleNOW offers three different approaches to solve this issue. Our most comprehensive solution combines a wireless scrub with wireless consent capture. This application lets you capture a valid written approval if you perform lead collection on your web site. Even if the application determines that the phone number is a landline, the information can be captured and saved for later use to show as an established business relationship with the consumer. You can also expand the single channel express consent into a full multi-channel solution with our MyPreferences® product. If you are attending the PACE convention this week, please stop by and chat!